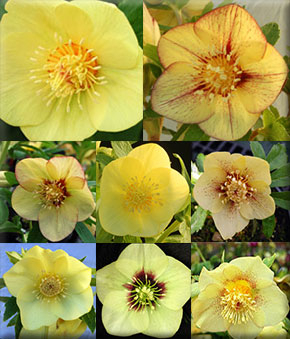 Flower Color: Deep golden to pale yellow, some with rose picotee edging and some have red streaking. Foliage: New leaves are chartreuse, darkening to green with a slight chartreuse cast in summer. Winter leaf color is golden yellow. Red petioles contrast beautifully with the gold. Comments: Winter Jewels™ hellebores are from a hand-selected seed strain, thus, as seedlings, each plant produces a slight variation in color and highlights. 'Golden Sunrise' leaves add interest to the winter garden. Handle drought conditions, once established. Deer resistant. Plant 18" to 20" apart.